If you are anything like me, then you often spend half of your weekend browsing through crowdfunding sites searching for the next big tech innovation that will change your life. If you are just as annoying as I am you flood your friends and relatives with emails entitled “URGENT: YOU MUST CHECK THIS OUT NOW” containing a link to some gadget that transforms air into bread. And if you want to be even more annoying – you write an article about some of these treasures of innovation. Hello and welcome to that article. I hope that instead of annoying it will be enlightening and inspiring enough to leave you wanting to part with a great chunk of your money. As at Drooble we are all about our love for music, I have compiled a short list of some of the more interesting (and likely to get funded to completion) tech products in the sphere of music. A mix of Indiegogo and Kickstarter to satisfy all your crowdfunding needs. We are very interested to find out what your opinion is on all these crazy gadgets, so don’t be shy and share your thoughts in the comments – are you excited about any of these products or are you feeling like ‘nah’ towards them? Ok, I have to say that their commercial looks suspiciously like the opening scene to one of the movies adults like to watch late at night by themselves. However, if you ignore all the suspiciously hot people looking to experience pleasure with the help of their headphones, this looks like a really cool new invention. Nervana headphones were created as a way to enhance the listener’s music hearing experience. It stimulates the Vagus nerve in our left ear canal, in sync with the beat of the song you are listening to. This, in turn, stimulates all the feel-good chemicals in the pleasure center of your brain, making you become relaxed, happy and damn glad you invested money in these headphones. 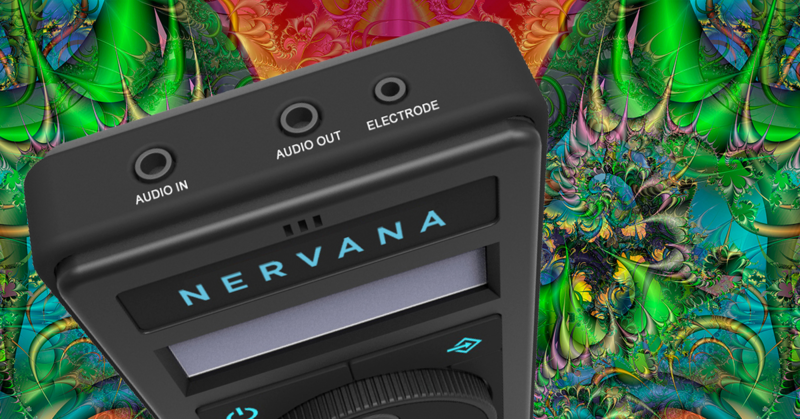 The headphones connect to the Nervana generator, which in turn is connected to your preferred music device. The machine then analyses the music signal of what you are listening to and sends an electrical stimulation to your Vagus nerve, hitting all those jolly-good points in your brain I mentioned earlier. Also, if you are at a concert or some other venue you can put the Nervana generator in its Ambient mode, where through its internal microphone it inputs sounds from your surrounding environment. So basically anywhere you go you can get high on the music you are listening to. Rest assured that it was thoroughly tested on a lot of people to ensure no one would die of “too much nerve pleasure” or other related accidents. How’s it doing on Indiegogo? People funded the hell out of it – 520% funded with 18 days still left to go. I guess the prospect of legally getting high anywhere, at any time, does seem appealing. Or people just like paying to get their ear electrocuted. It also ships worldwide. Are you sick of the lame old lighting at your home? Are you looking to be the coolest kid on the block? Well, Vivi Music LED Controller will make all your dreams come true … or will at least try. Visual Vibes or Vivi is the brainchild of Matt Kachur who had a simple dream – make lights dance to music. After an unsuccessful search for such a creation he decided to build one himself and five years later he is putting it out there for the whole world to use. I have to say it does look impressive and an amazing addition to any regular party thrower’s arsenal. Well, as far as I can tell it is like a lamp with a fun factor. It has three outputs for bass, mids and treble which you can connect to any WS2812B lights. As it says on the Kickstarter page “audio is input to a 3.5mm jack using an aux connection or microphone. Add 5 Volt power and let the show begin” and Voila – magic. Good job, Matt, for creating a very simple to use device that leads to an amazing explosion of colours. Vivi requires no set up of any kind, as we all know, programming a song can take an incredibly long time and with Vivi you skip all that and just enjoy the light show. You control it through an app on your phone connected to the device via Bluetooth. Apparently, it can be a lamp if you want it to. It can function just like regular lightning sources, only make it fun and flashy when you want to. Another great feature is that it is mobile due to its small size, so basically you can bring the party anywhere – your car, your home, your workplace – just put up some LED lights, plug it in, play some tunes and boogie. Vivi is indeed a very cost and time effective solution to creating a great light show be it for your own personal use or for your business. How is it doing on Kickstarter? The campaign has so far collected almost $10 000 of its $25 000 goal with less than 20 days to go. If you feel inspired by this colour of music, get your wallets out and start supporting the future existence of Vivi. Check PART 2 for more innovative music technology. Technology is fun, isn’t it? It is exciting to know that our experience of music will not be set in stone. Perhaps the future holds many amazing opportunities for us to even better and deeper connect with music. In the meantime, we at Drooble invite you to the find some like-minded musicians and jam together – old school style.